We thought about what we want, as riders, when we’re shopping for saddle pads and then we brought it to life: outstanding quality, classic styling, and unbeatable prices. This pad is extra lightweight and breathable to keep your horse cool and dry. 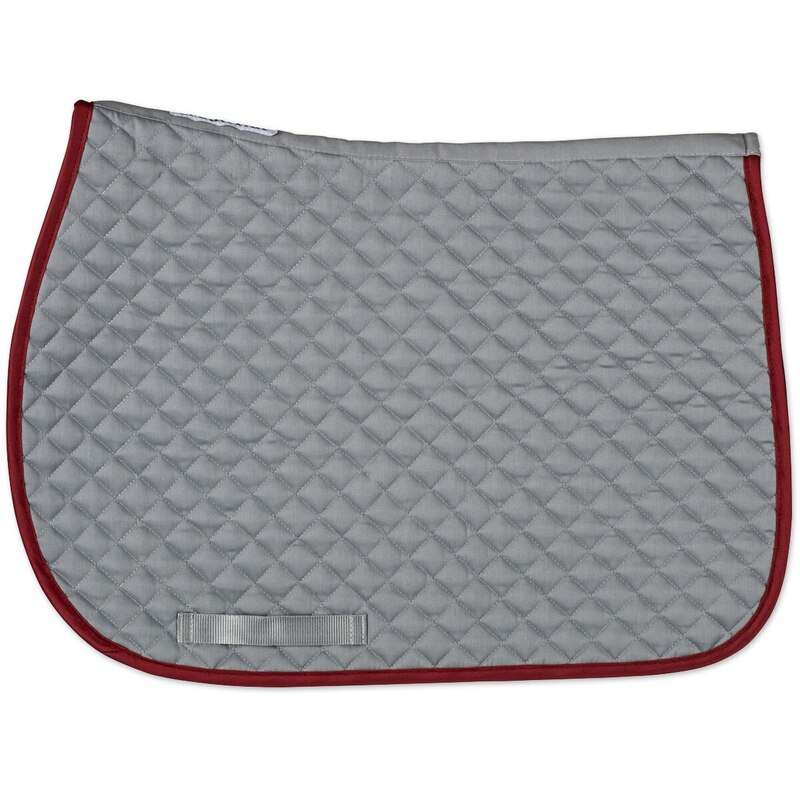 It also has soft quilting to keep your horse comfortable on any ride. Designed to fit most all purpose and close contact saddles, this pad has sturdy girth straps to help keep your saddle in place. Plus, it’s available in a stylish grey base color with a variety of traditional and fun piping options and easy to customize with a monogram, name, or barn logo to match your style. Finally, classic styling means you and your horse will always look your best. This is the perfect schooling pad! Looking for this pad in white? Click here! 21 ¾" spine x 18" drop. 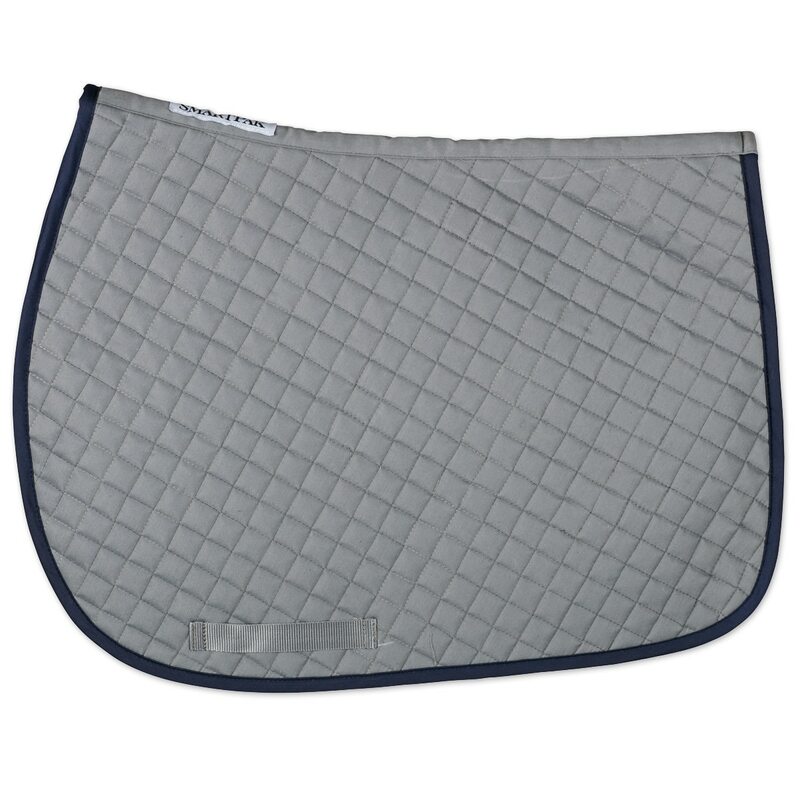 SmartPak Lite Grey AP Saddle Pad is rated 4.8 out of 5 by 4. 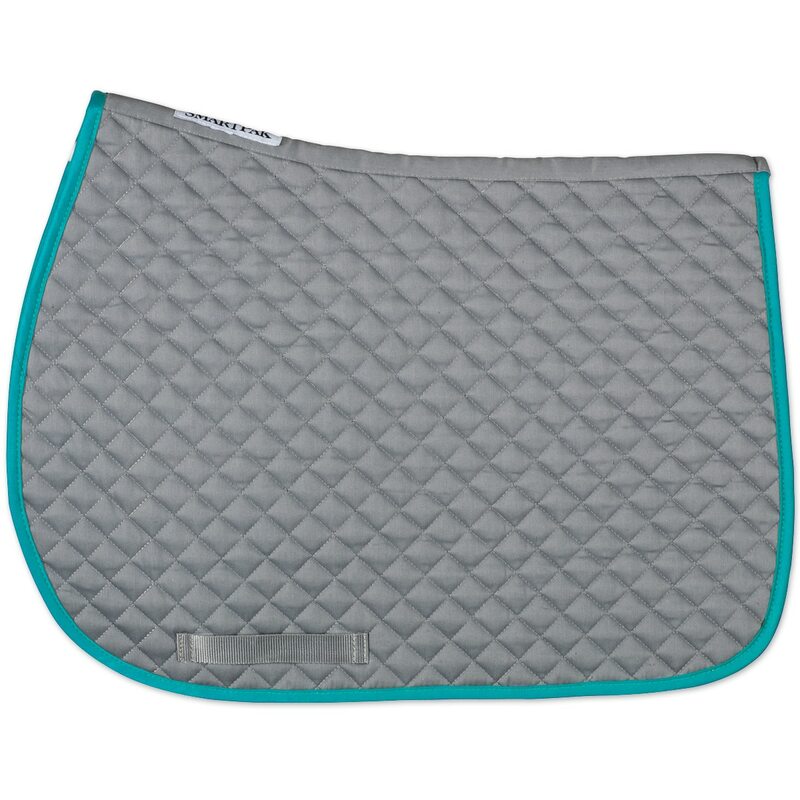 Rated 5 out of 5 by IrishMelody from My new favorite saddle pad I have the turquoise trim and the hunter trim and they look great! The grey body is more silver and looks fabulous on my grey girl. They are the perfect mix between a baby pad and a regular pad. They have the girth loop but not the velcro straps and that is perfect because I don't like the velcro straps. It fits great under my ThinLine half pad, which can hang over on some pads. It is lightweight enough that I will use it all year round in FL but sturdy enough that it maintains its shape and doesn't bunch up under the saddle at all. I hope SmartPak makes more trim colors, I will replace my schooling pads one by one. Rated 5 out of 5 by Equestrian09 from Very nice; love the grey! I love this pad; wicks sweat well, is pretty and a classic cut. My only complaint is that the size is a bit small for my 18.5" close contact/jump saddle and my Large Thinline trifecta half pad is longer at the back of my saddle, leaving a pressure point. Frustrating that at 5' 10" I am apparently the tallest person in the world and riding the biggest saddle in the world, as few things fit without going custom. Rated 4 out of 5 by hman from Looks Great Embroidered I really like how this saddle pad looks when it is embroidered with the same color at the trim. It really pops! 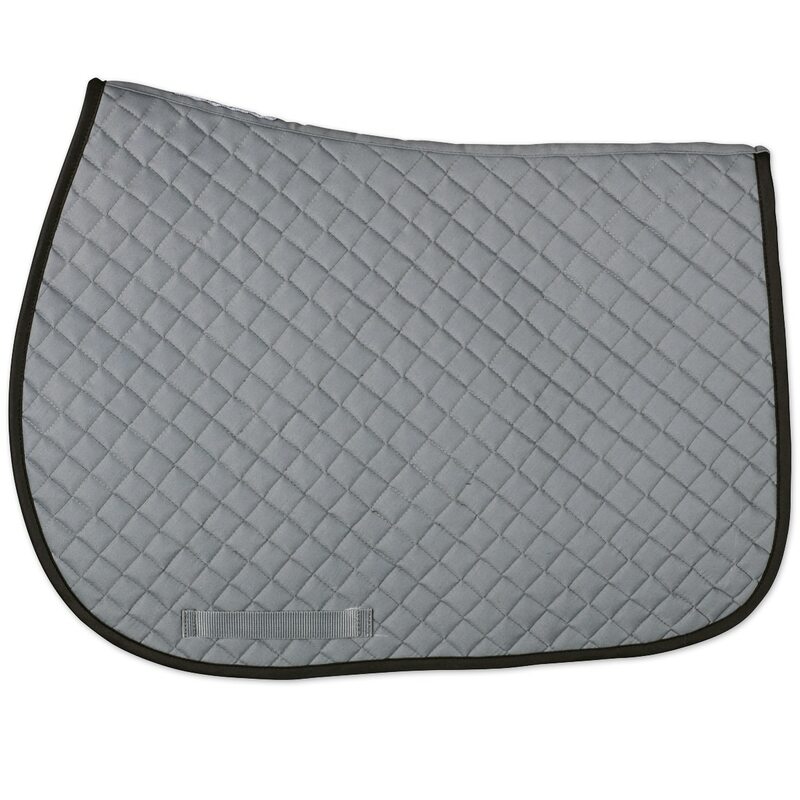 Overall I really like this saddle pad. One quality issue is that the trim is not a seamless transition. Thankfully it is at the top of the pad so it will not be as visible when riding. It would be a 5 out of 5 if it the trim had a better transition.